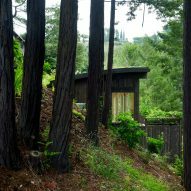 American studio Feldman Architecture has created a pair of wooden structures that are perched on a steep, forested site in the San Francisco Bay Area. The Mill Valley Cabins take their name from the northern California town where they are located. The forested site is a short distance from Muir Woods National Monument and the Pacific Coast. 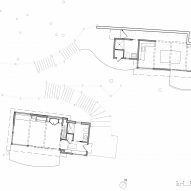 The cabins are situated on a sloped property with an existing family home. The owners – one an artist, the other an avid gardener and yoga enthusiast – wanted studio buildings where they could enjoy their creative and recreational pursuits. The cabins also serve as guest houses as needed. 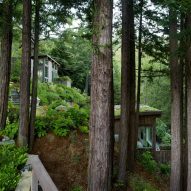 Accessed via a stone pathway, the wooden buildings are perched on a steep site that offers "seclusion and inspirational views" of the surrounding landscape, which is blanketed with redwoods and pine trees. 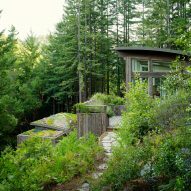 The artist studio, which was placed higher up, looks out over tree canopies, while the yoga building feels more embedded in the tranquil forest. 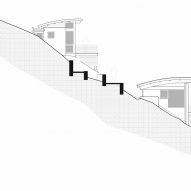 By creating two little dwellings, rather than one large one, the team was able to minimise the impact on the terrain. "Dividing the programmatic needs into separate cabins allowed the two small structures to be placed lightly between existing trees with minimal re-grading of the site," said Feldman Architecture, a San Francisco-based studio. Both studios have gently arching roofs and exterior walls clad in distressed boards made of spruce and pine. Large windows and sliding glass doors usher in natural light and strengthen the connection to nature. In the artist studio, skylights bring in additional daylight. The roof of the yoga studio is covered with a multi-coloured array of plants, providing "a quilt-like garden for the artist to look down upon". 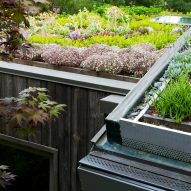 The green roof also serves as a "canvas" for the garden lover. Inside, the buildings feature wooden floors and white walls. Decor and finishes were kept restrained in order to maintain a focus on the peaceful surroundings. "The simple and modern interiors of the studios offer spaces for quiet reflection among the trees," the architect said. 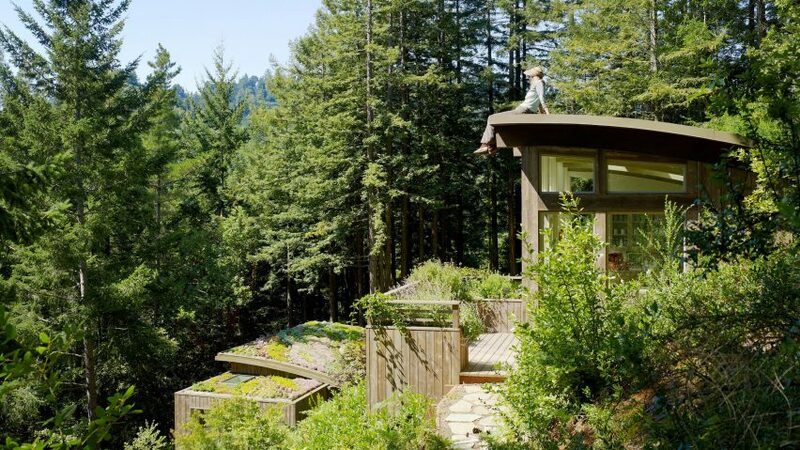 Feldman Architecture has created a number of distinctive dwellings in California. Others include a home with rammed earth walls that is situated in an eco-friendly development, and a wood-clad residence with glazed garage doors in Sonoma Valley.